It is important for the organization that the quality products are delivered to the customers since they are the top most drivers for the organizational success. After all, growing sales make the foundation of the organizational performance not only to remain consistent but also make it strong and sturdier. However, in the organization, employees do make mistakes and machines and equipment do have breakdowns. The goal of the product quality management is to minimize this so that the customer remains happy with the product performance and reorders the products. For this the organization is to put a relentless focus on product quality. Improving product quality save the organization the cost since it needs not to do things to cover up old mistakes. Improving quality also raises the employees’ engagement since they like to be on a high performance team. Product quality management includes the following four major components. They are (i) quality planning, (ii) quality control, (iii) quality assurance, and (iv) quality improvement. Quality planning is the process for ‘identifying which quality standards are relevant to the product and determining the procedures and techniques to satisfy them’. Quality planning means how to fulfill the process and deliverable products quality requirements. It helps the organization to schedule all of the tasks needed to make sure that the products meets the needs of the customer. Quality planning is a critical part in the manufacture of any product. It enables the organization to agree a set of quality targets with the customer. It also helps to monitor and control the level of quality of the products and to ensure that the products meet the quality targets set. By using the quality plan templates, the organization can set quality targets and ensure that the deliverable products meet the customer’s needs, thereby ensuring the success of the organization. Quality planning is a structured process used for the development and the manufacture and the delivery of the product with the quality features incorporated in it as required by the customer. The tools and methods of quality planning are incorporated along with the technological tools for the particular product being developed, manufactured and delivered. Designing a product needed by customer needs the process, methods, tools, and techniques of quality planning to ensure that the final designs of the product not only fulfill the best technical requirements but also meet the needs of the customers. The quality planning process and its associated methods, tools, and techniques are developed to manufacture the products which unerringly delight the customers. The customer is disappointed when there are frequent, large gaps in quality which are really due to the compound result of a number of smaller gaps. The first component of the quality gap is the understanding gap, which is, lack of understanding of what the customer needs. Sometimes this gap opens up because the manufacturer simply fails to consider who the customers are and what they need. More often the gap is there because the supplying organization has erroneous confidence in its ability to understand exactly what the customer really needs. The final perception gap also arises from a failure to understand the customer and the customer needs. Customer does not usually experience a product simply based on the technical merits of the product. Customers react how they perceive the product provides them with a benefit. The second constituent of the quality gap is a design gap. Even if there are perfect knowledge about customer needs and perceptions, many times the organization fails to create designs for the products which are fully consistent with that understanding. Some of these failures arise from the fact that the employees who understand customers and the disciplines they use for understanding customer needs are often systematically isolated from those who actually create the product designs. In addition, designers of the product often lack the simple tools which enable them to combine their technical expertise with an understanding of the customer needs to create a truly superior product. The third gap is the process gap. Many splendid designs fail because the process by which the product is physically manufactured is not capable of conforming to the design consistently time after time. This lack of process capability is one of the most persistent and bedeviling failures in the total quality gap. The fourth gap is the operations gap. The means by which the process is operated and controlled may create additional deficiencies in the delivery of the final product. Quality planning provides the process, methods, tools, and techniques for closing each of these component gaps and thereby ensuring that the final quality gap is at a minimum. The basic steps of quality planning include (i) establishment of the project, (ii) identification of the customers, (iii) discovering the customer needs, (iv) development of the product, (v) development of the process, (vi) development of the controls, and (vii) implementation of the developed process and controls during the manufacture of the product. The first step, establishment of the project, provides the clear goals, direction, and infrastructure required if the constituent quality gaps are to be closed. The next step provides for systematic identification of all the customers. It is impossible to close the understanding gap if there is the least bit of uncertainty, fuzziness, or ignorance about who all the customers are. The discovery of customer needs in the third step provides the full and complete understanding required for a successful product design to meet those needs. It also evaluates customer perceptions explicitly so that the final perception gap can be avoided. The development of the product step uses both quality planning tools and the technology to create a design which is effective in meeting the customer needs, thereby closing the design gap. The process gap is closed in the next step which is the development of the process. Quality planning techniques ensure that the process is capable of delivering the product as per its designs consistently and time after time. Finally, the operations gap is closed by developing process controls that keep the process operating at its full capability. Successful elimination of the operation gap also depends on an effective transfer of the plans to the operating forces. A strong transfer plan, executed well, provides operations with all the processes, techniques, materials, equipment, skills, and so on to delight customers on a continuing basis. Quality control is a process which measures and determines the quality level of products. It is the activities or techniques used to maintain the product quality. It is the way of ensuring that the results of the manufacturing process are the same as was expected. It emphasizes testing of products to uncover defects and reporting to production management who make the decision to allow or deny product release. Quality control consists of finding and eliminating causes of quality problems through tools and equipment so that the requirements of the customer are met on a continuous basis. It is a product based approach. It is concerned with the operational activities and techniques which are used to fulfill the requirements of quality. Quality control is the most basic level of quality. It starts with activities whose purpose is to control the quality of products by finding problems and defects. Various definitions of the quality control are as follows. ISO 9000 defines quality control as ‘a part of quality management focused on fulfilling quality requirements’. Quality control is the process involved within the system to ensure job management, competence and performance during the manufacturing of the product so as to ensure that it meets the quality plan as designed. Quality control is also defined as ‘the operational techniques and activities which are used to fulfill requirements for quality’. Quality control is the physical verification to ensure that the product conforms to the planned arrangements by inspection, measurement etc. It is the process of meeting products to the expectations of the customers. It is a set of activities for ensuring quality in products. The activities focus on identifying defects in the actual products produced. Quality control is a procedure or set of procedures intended to ensure that a manufactured product adheres to a defined set of quality criteria or meets the requirements of the customer. It involves verification of output conformance to desired quality levels. It is used to verify the quality of the output. It is a set of activities designed to evaluate a developed work product. It is the process of executing a system with the intent of finding defects. At its simplest, quality control is inspecting, testing or checking of the product to make sure it is as per specification. The intent is to identify anything that is not as per specification, and either fix it or eliminate it, to make sure it conforms to the specifications, and has/does/functions as required. Quality control is typically done at the end of the line, before the product ‘goes out of the plant gate’. If the something is not as per specifications then it is called ‘nonconformity’ or a nonconforming product. The objective of quality control is to make sure that the products to be delivered are defect free and acceptable as per the quality requirements of the customer. If the products are not found as per the requirements, a suitable corrective action is to be taken. Quality control includes all activities which are designed during quality planning to determine the level of quality of the products for delivery. It is a reactive means by which quality is gauged and monitored, and includes all operational techniques and activities used to fulfill requirements for quality. It does not ensure quality. It only finds instances where quality is missing. Obviously it is better than nothing, but it has its limitations. Quality assurance is a complete system to assure the quality of the products produced by the organization. It is not only a process, but a complete system which also includes controls. It is process oriented and ensures that right things are being done in a right way. It is a way of management. It is an effective tool in the hands of the management to mitigate risk. Quality assurance is developed from the realization that quality can be improved by looking ‘further up the line’. It is aimed at preventing nonconformities/defects. Various definitions of quality assurance are given below. ISO 9000 defines quality assurance as ‘a part of quality management focused on providing confidence that quality requirements will be fulfilled’. Quality assurance is ‘all the planned and systematic activities implemented within the quality system which can be demonstrated to provide confidence that a product or service will fulfill requirements for quality’. Quality assurance is defined as a procedure or set of procedures intended to ensure that a product under development (before work is complete, as opposed to afterwards) meets specified requirements. Quality assurance is fundamentally focused on planning and documenting those processes which assure quality includes things such as quality plans and inspection and test plans. It is a system for evaluating performance, service, of the quality of a product against a system, standard or specified requirement of the customers. It is a system of checks designed to ensure that products are free of faults. It is a set of activities designed to ensure that the development and/or maintenance process is adequate to ensure that the system will meet its objectives. Quality assurance is the process of managing quality. It is a set of activities for ensuring quality in the processes by which products are developed. It is the process or set of processes which are used to measure and assure the quality of a product. It attempts to improve and stabilize production (and associated processes) to avoid, or at least minimize, issues which led to the defect(s) in the first place. Quality assurance process is a proactive process. The purpose of quality assurance is to prevent the defects entering into the product during the stage of its manufacturing. Hence it is process oriented which focuses on the defect prevention. It is done through a focus on the process used to make the product. Quality assurance is a function of the management to assure to the customers the quality of the products. Branded products are examples through which customers are assured of certain qualities in the products by the manufacturer. Quality assurance is not only a process, but a complete system which also includes control. It is done by establishing a good quality management system and the assessment of its adequacy, conformance audit of the operation system, and the review of the system itself. Quality assurance is the prevention of quality problems through planned and systematic activities including documentation. The documentation sets guidelines that are necessary to be implemented to assure the quality of the product after production conforming to the specification, other stated requirements and expectations from the product. Quality assurance activities start in the very beginning of the production cycle, even at the planning stage of the production. Quality assurance is achieved by adequately developing and implementing the quality assurance process. The process is carried out by accurately defining the manufacturing process of the product, making quality plans, inspection and check plans at the intermediate stages of manufacturing, quality audit plans, use of measurement tools and defect tracking tools, use of statistical tools for statistical analyses, and training of personnel in the selected methods and processes. By the adaption of process based approach of quality assurance, the organization can reduce drastically the product rejection rate, avoid the rework and improve the product yield. This helps in the cost management of the organization. However it is to be noted that quality assurance is not the responsibility of selected persons or of a department but it is the responsibility of the entire team of employees who are even remotely connected with the production process. The fundamental concept underlying quality improvement is that a system left unchanged can only be expected to continue producing the same results. To achieve better performance, it is necessary to change the system in ways that enable it to produce the improved result. Quality improvement is a systematic, formal approach to the analysis of practice performance and efforts for the improvement of the performance. A variety of approaches also known as ‘quality improvement models’ exist which help the organization to collect and analyze data and test change. While it is important to choose a reputable quality improvement model to guide the organizational efforts, it is more important that that the organizational management fully commit to using the process of quality improvement as well as good quality improvement practices. A strategic approach to quality improvement is essential in the organization for best eliminating the waste of efforts towards maintaining the product quality. By following the following five steps, quality can be improved in a meaningful, sustainable way. Use of a team mindset – Quality improvements in the products cannot be sustained by individual employees. To really make lasting and meaningful change in manufacturing processes, it is necessary to adopt a team-based approach. By involving multiple disciplines in the search for improved quality, a variety of perspectives is obtained. Also it is important to have knowledge of process history since it throws light on the reasons for the present stage of the process. There is always a reason or cause which is required to be considered so as not to repeat the problem of days gone by. By considering history and group perspective, solid improvements can be obtained. Define quality from the customer viewpoint – Very often, employees within a manufacturing environment want to make a product better. However, they really do now know what is better. With additional cost, it is almost and always possible to make the product better. However, it is to be noted that whether the additional cost is desirable by the customer even if it means better product life. It is necessary to use the customers’ perspective to define what the best-in-class product is to be and to meet the requirements to produce such products while minimizing cost. Develop organizational understanding of the cost of quality – The cost to fix a defect in the product once it reaches a customer is dramatically higher than the cost to fix the source of the problem before it is created. It is essential that the employees manufacturing the product be trained to understand the cost multipliers involved with warranty repair or replacement and cost of damaged reputation. Once the employees take this perspective, a desire to find root cause for problem solving is inherently developed. Solve problems completely – Very often, manufacturing quality improvements fix the symptoms of failure rather than the root cause. This can be done by adding quality inspection steps or rework stations that make it more efficient to fix defects. Instead, a true understanding of root cause needs to be developed within the teams. When teams develop the ability (through fault tree, or five-why analysis etc.) to ascertain root cause of defects in the manufacturing process along with a ‘killer test’ which verifies the ability to turn-on and turn-off the problem in the manufacturing process, true solutions to problems can be created which does not allow the return of the issue. Employment of strong process discipline – Throughout the quality improvement process, it is essential that strong process discipline is employed. Depending on the product that is being manufactured, deviation without proper team cooperation and anticipation of the change can have serious quality repercussions. While the organization is to avoid cumbersome bureaucracy which prevents innovation, it is essential that some structure be employed to maintain consistency and an understanding of the way the product is produced during that time period so that root cause can also be identified later if new problems arise as a consequence of the change. Quality improvement in general describes a paradigm for systems change. This comprises a set of values and tools for setting goals and planning, implementing and measuring change. The components which are most influential stem from the work of quality gurus such as Deming and Juran who have primarily worked within the manufacturing industries. 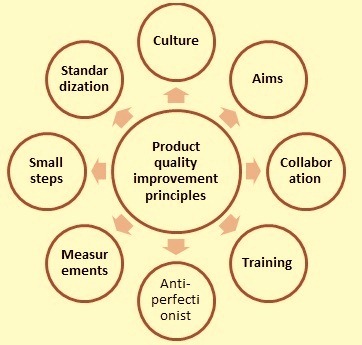 There are a number of common principles which can be applied for the product quality improvements (Fig 1). These include the following. Culture – A culture of quality is required to exist throughout the organization. Quality is to be prioritized over other issues and every member of the organization is to be involved in delivering and improving quality. Aims – The needs of the customer are paramount, with the key aim being delivery of quality as perceived by the customer. Collaboration – Teamwork, evidenced by joint learning, product planning to product delivery, is critical to the organizational work. Training – Specific tools and techniques are employed to improve quality, rather than intuition and consensus alone. As with any science, there is a need to train employees to apply these. Anti-perfectionism – It is to be never assumed that ideas for product quality improvement are perfect. Even seemingly excellent ideas are tested and refined through practical implementation before being fully adopted. Quality improvement is always to be considered as a journey, requiring one to be always asking new questions and finding new solutions. Measurement – Measurement is important since when assessing processes and outcomes, extensive use is made of data, to identify areas needing improvement and to evaluate the impact of changes. Small steps – The use of small pilots or ‘tests of change’ is used to implement innovations as a means to refine plans through identifying and removing problems before wide-scale roll-out. Standardization – Ad hoc customized solutions are sometimes necessary, but standardized approaches to similar problems are preferred, in order to benefit from measurement, refinement, teamwork and economies of scale. Arising from these principles, a science of improvement has emerged, providing a set of tools and techniques for planning and implementing change. Some tools are based on theoretical frameworks, such as ‘Lean Manufacturing’, ‘Six Sigma’ and the ‘Model for Improvement’, whereas others are more pragmatic. Each framework has a unique focus and addresses slightly different problems. However, each seeks to help employees with the challenge of getting evidence or innovation into practice reliably and efficiently, and it is usual for the organization to adopt aspects of more than one framework in its quality improvement efforts. The abovementioned three frameworks are described briefly below. Lean Manufacturing – It seeks to improve the quality and efficiency of processes, and the satisfaction of employees and customers, through eliminating waste and unnecessary activity. It has been described as ‘a way of streamlining the product journey and making it safer, by helping the employees to eliminate all kinds of waste and to produce quality products with existing resources. Widespread gains have been proposed by its proponents. .
Six Sigma – This framework uses a process or pathway-oriented approach to identify and minimize the generation of products which are unreliable, inefficient or ineffective. It places a strong emphasis on reducing inappropriate variation in the product quality, and places the needs of the customer above that of the system or employees. It is ideally suited to improving the quality and efficiency of high-volume processes. Its use is particularly advocated in combination with Lean Manufacturing, as the two complement each other in their approaches of improving flow and reducing variation. The Model for Improvement – The Model for Improvement is a framework for planning and implementing change. It emphasizes (i) the value of clear goals, (ii) measurement of processes, outcomes and unintended consequences, and (iii) small testing cycles to refine solutions before widespread roll-out. Changes are introduced in a controlled way, with frequent measurement and rapid feedback, in order to identify aspects of change ideas which need refining and improve them before they are rolled out across the organization.